When it comes to dampening, urethane durometer is very important, as well as volume of urethane, and quality of urethane. Replacing your engine or differential mounts require more than picking a bushing durometer. Durometer, volume of urethane, and grade of urethane (or other material) all directly influence the transfer of power to the wheels, the transfer of NVH (noise, vibration, harshness) into the cabin, and the longevity of the urethane. The Perfect Polyurethane: The perfect urethane would transfer all engine output to the wheels, transfer no NVH into the cabin, and the urethane would last indefinitely. At this time, this is not a perfect world and this urethane does not exist -- don't get bummed out, let's go on. What is Durometer? Durometer is the hardness value of the polyurethane. To determine the hardness, or resistance of indentation, we use a Shore Durometer gauge to penetrate the urethane sample. The Type A hardness scale ranges from 0 to 100. All of our urethane falls between 70A and 96A durometer. What happens when hardness increases? As engine output is increased, so should the durometer of the bushing. What should I expect with a softer bushing? How does engine output or horsepower relate to urethane? The more load placed on the engine/differential mount, the harder the urethane should be. Choosing the correct urethane for your engine output and driving characteristics will directly relate to the lifespan of the urethane. What does the volume of material have to do with NVH? Depending on the application and confinements of the engine bay dimensions, by using a larger bushing, we can dissipate more noise, vibration, and harshness. 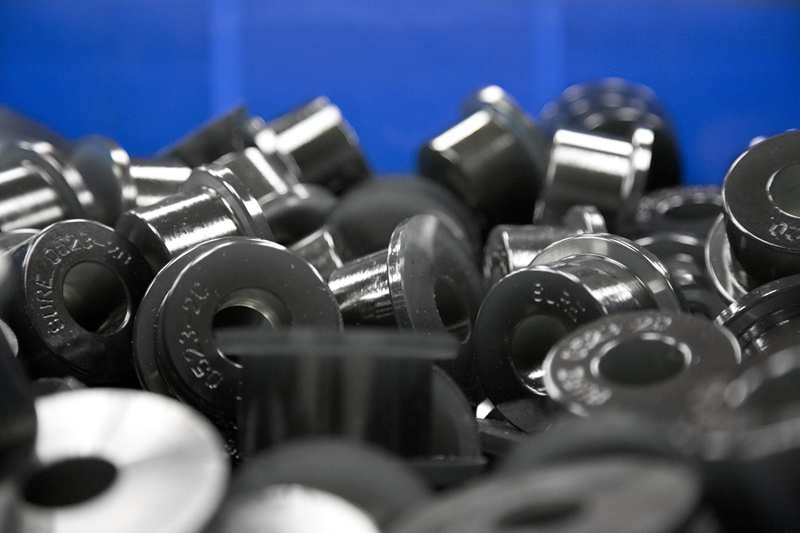 Our bushings are not off-the-shelf parts; we design each mount around the optimal size bushing for each application. How do I get the most power to the wheels? If your primary goal is power, go with a high durometer urethane option. The harder the urethane, the least amount of power lost in the drivetrain and the most amount of power transferred to the wheels. With a high durometer value comes more NVH! We use virgin urethane (no additives) in all of our urethane products. Additives, lesser grade urethane, and rubber, typically shorten the life of the bushing, something we are not interested in. We are constantly refining our urethane specs for all of our applications. It is a continued effort to yield the highest amount of performance, the least amount of NVH, and the longest lifespan of the bushing. Want some facts on our urethane? Thank you for the support. If you have any additional questions, give us a shout! Posted on April 15, 2013 by JATO.